When three children last month starved to death in Delhi, several people were shocked. How could people possibly die of hunger in the nation’s capital, was the unspoken question they had in mind. But honestly, it did not come as a surprise to me. This was primarily because I have been working among the homeless for the past decade and a half. If we had eyes to ‘see’, we would have seen stark poverty staring at us from the streets, from right outside our home. But we have been enormously successful in building an uncaring, insensitive society, which is not moved by gross inequality or the paradox of abject poverty in the midst of plenty. It unfortunately does not bother the middle class. There are around 100 million Indians who are constantly on the move in search of livelihood. They are not completely cut off from their roots. They do keep visiting their villages, even find work there for some time. But they are forced to lead a nomadic life, moving from one city to the other in search of work. But there is no scheme for them; there is no plan to take care of these people, to ensure that they get proper meals, have a proper shelter and lead a life of dignity. There is no law for them either. They do not fit into anyone’s agenda. We do have a Food Security Act. This Act provides a minimum of five kilos of foodgrains per head. This particular family had three children and, therefore, were entitled to 25 kilos of foodgrains. But it is clear that they did not have access to foodgrains or else the three children would not have died. Some media reports suggested that they did not have the ‘Ration Card’ or, if they had, they were valid only at the place they came from. This problem of portability needs to be sorted out. The migrant labourer should be able to produce his ration card anywhere and get the same supply of foodgrains. Their children should have access to the local Anganwadi, schools and midday meals. Their mother should have access to maternity and medical benefits wherever she lives. It is obviously a management issue, an accounting problem with states likely to take the stand that they cannot be held responsible for people from other states, that they cannot supply foodgrains to people holding BPL (Below the Poverty Line) cards issued in other states. To my mind, it is a shame. This is callous as well as criminal to deny people their right to live, to deprive them of their rights and push them to die of starvation. What kind of greatness can we possibly claim if we are not able to sort out this issue of portability of rights? Every time there are deaths by starvation, the official machinery goes into an overdrive to prove that the households had access to foodgrains. This is because of the mistaken but widely held belief that death by hunger means the deceased had not eaten for days. Death by hunger results from being deprived of sufficient food, sufficient calories required to live, over a long period of time. That is why it is meaningless in such cases to hold post-mortem examinations. Our failure to provide a social security net is at the root of this tragedy. We are now informed that the mother had an ‘intellectual disability’ (not mental disorder) from birth and should not have married or given birth to children. She apparently could not take care of herself. We now know that the father, who has disappeared, was a rickshaw puller. But both society and the Government let down this extremely vulnerable family. Every sensitive society and government in the civilised world is held responsible for supporting the vulnerable sections of society. But here, both society and the Government have abdicated the responsibility and have got away without any censure. The late Tamil Nadu chief minister J. Jayalalitha had started the ‘Amma canteen’ to ensure affordable meals to people. 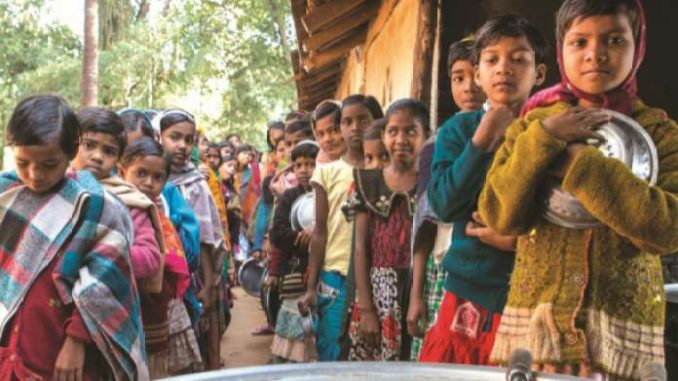 They would get nutritious and hygienically prepared food for as little as five Rupees. And I have personally seen solitary, unescorted children visiting the canteens with five Rupees and eat there. This needs to be replicated in every city. Every time there are deaths by starvation, the official machinery goes into an overdrive to prove that the households had access to foodgrains. This is because of the mistaken but widely held belief that death by hunger means the deceased had not eaten for days. Death by hunger results from being deprived of sufficient food, sufficient calories required to live, over a long period of time. That is why it is meaningless in such cases to hold post-mortem examinations. But in the case of these three children, post-mortem was conducted not once but twice. The Government’s intention clearly was to find some trace of food and fat. That neither exercise could find any trace of food and fat would have been comical but for the tragic circumstances. It is a crime to be poor. Like in the jungle, it is the survival of the fittest. Democratically elected Governments are doing everything in their power to exclude people and the poor from getting benefits that are rightfully theirs. Successive Governments in Delhi, to cite an example, insist that only people who have been residents in the city for the past five years, and have relevant documents to establish this fact, would be eligible for benefits from the state. This is the unkindest cut, designed to break the back of the poor. I have written this before. India’s rank on the Global Hunger Index has been falling quite fast. In the year 2000 we were ranked after 84 countries which had a better index. Now India is ranked 100th after 99 countries which are better off. But this does not cause any unease. Nobody thinks this is a slur or a shame. Nobody is interested in holding any discussion or hold the Government accountable. It does not matter to people. But when India slipped a few ranks in the ‘Ease of Doing Business’ index, the entire union government was galvanised into action. The Prime Minister was concerned. Ministries and ministers went into an overdrive. Meetings were held to find ways of arresting the slide! Suggestions were invited! But nobody was bothered about hunger. India, we are reminded at every opportunity, is the fastest growing economy in the world. Our GDP growth rate is higher than every other country, it is pointed out. But in this ‘Shining India’, every third child suffers from malnutrition. Indeed, one in three malnourished children in the world is an Indian. Yet, the Indian middle class corners three times the benefits the state provides to the poor. Indian corporate sector enjoys benefits which are several thousand times more. However, it is the subsidy to the poor that causes eyebrows to rise and sends experts and the media on a tailspin. As for fighting with hunger, the Government does not have the will; and the society does not have any interest. As told to Bhasha Singh.